The Gospel is proclaimed to us to set us free from these potential corruptions, and to help us in our turn be ministers of mercy. In his letter establishing the Year of Mercy, Pope Francis reminded (as did St James in the second reading yesterday) of the works of corporal mercy. stranger, heal the sick, visit the imprisoned, and bury the dead…. We cannot escape the Lord’s words to us, and they will serve as the criteria upon which we will be judged: whether we have fed the hungry and given drink to the thirsty, welcomed the stranger and clothed the naked, or spent time with the sick and those in prison (cf. Mt 25:31-45). 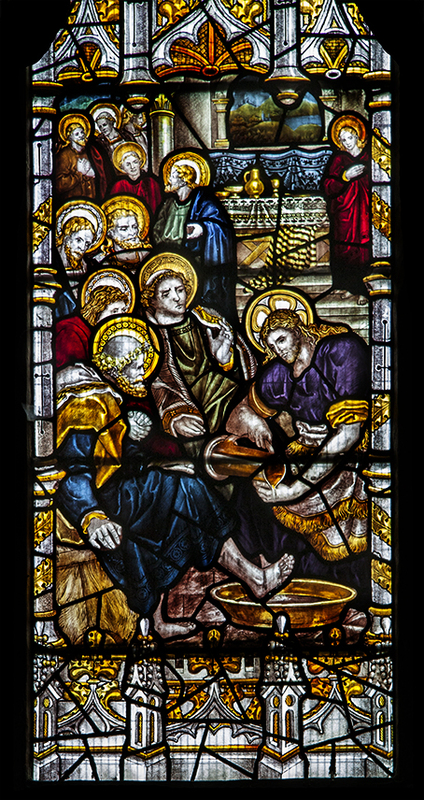 The washing of feet. Grantham Parish Church. (C) 2011, Allen Morris.